The Blessing of the Fleet is an age-old maritime tradition that originated in the Mediterranean. A blessing from the local priest is meant to ensure a safe and bountiful season. On the west coast of Australia, there are many commercial fishing fleets that work out of local ports, marinas and coves. 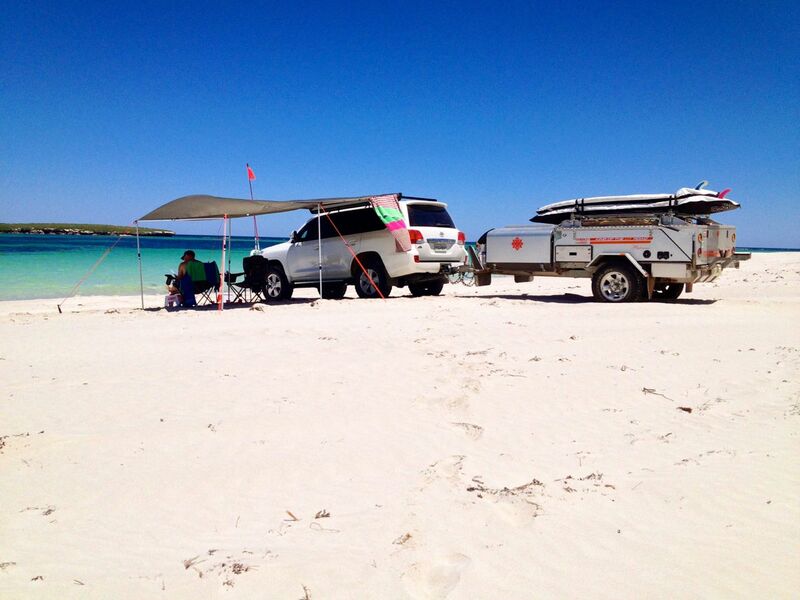 For years, we had been hoping to get to the Blessing of the Fleet at Jurien Bay, and finally the stars aligned to enable us to head up the coast for the 2013 Indian Ocean Festival. The first phase of the drawers and third battery install. The night before we left, the Driver was still installing the third battery and finishing Phase 1 of the drawers for the back of our brand new 2013 Landcruiser 200 series Altitude, AKA Alby. At 11pm we called it quits and decided we would make do without the Engel in the car for the weekend. As a result of the late night, our early start went out the window the following morning. The Dog went to the folk’s place for the weekend, and we finally hit the road right on peak-hour traffic. 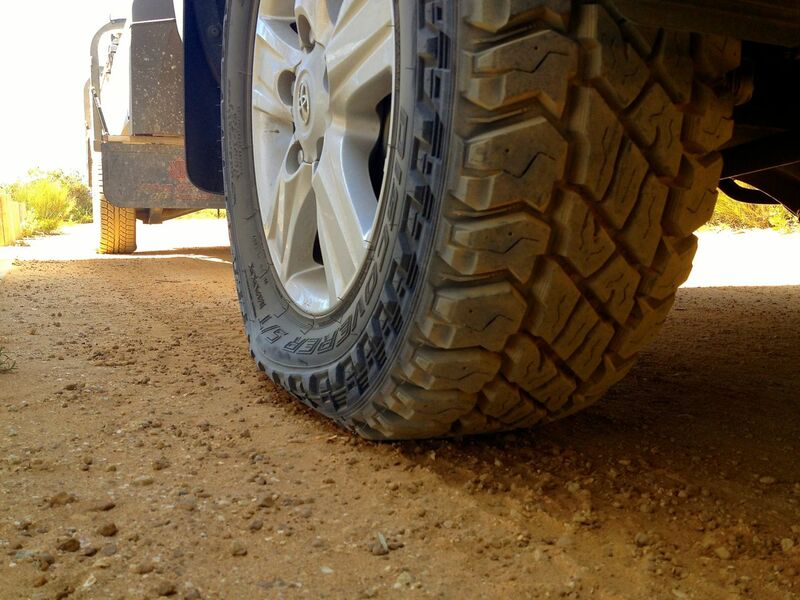 We made the Perth 4wd show around 10:30am and spent the best part of four hours checking out all the gadgets and gear. By 2pm, we’d just about had enough of the heat and crowds at the show, so we headed north – three hours later than planned. 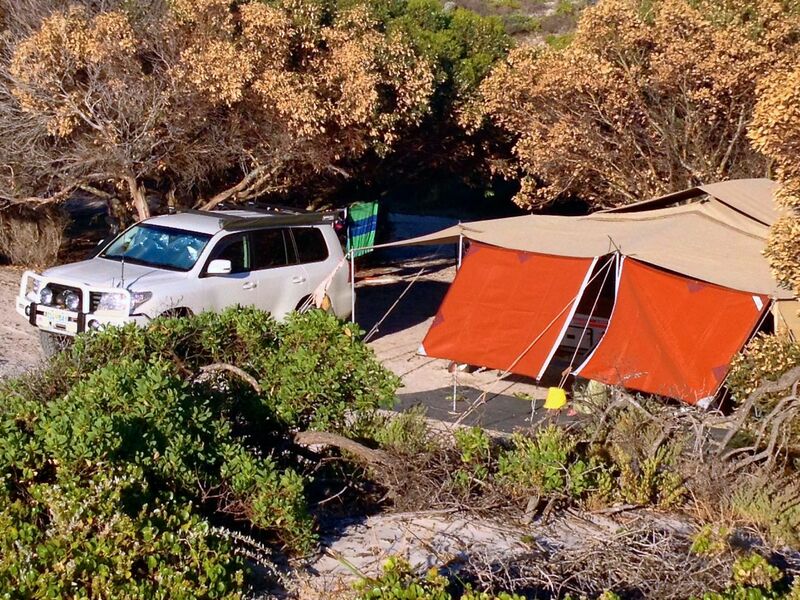 With some minor detours and a quick stop in Jurien for drinks, we finally headed to our favourite campsite just up the coast. The Driver decided to take a short cut through one of the back tracks. Famous last words at nearly 6pm with the sun going down. Needless to say, we had to turn around and get onto the main track again as we had ended up at a dead end. Keeping the afternoon sun off the camper. The adventure however, provided the first real scratches on Alby. There’s nothing quite like that piercing sound of branches scraping down the side of pristine paintwork. We both just held our breath and pushed on through the scrub. Finally, we pulled into our campsite around 7pm and set up in the howling south-east wind. Luckily our spot has reasonable protection from trees and shrubs. By 9pm we’d had a feed of nachos, a cold beer, hot shower and were into bed. Listening to the waves tumble and swirl around the reefs while we drifted off to sleep was just so peaceful. A lazy start to the day with bacon and egg sarnies washed down by hot coffee was just what the doctor ordered. It was a gorgeous morning so we headed out for an explore in Alby. The bay was crystal clear with all the sea weed washed out by the outgoing tides. We followed the tracks south and checked out some of our other favourite spots. There were quite a few campers at the Cove but we found an isolated stretch of beach for a dip, which was just so refreshing. By mid-morning we were off to town for a squiz at the Festival. 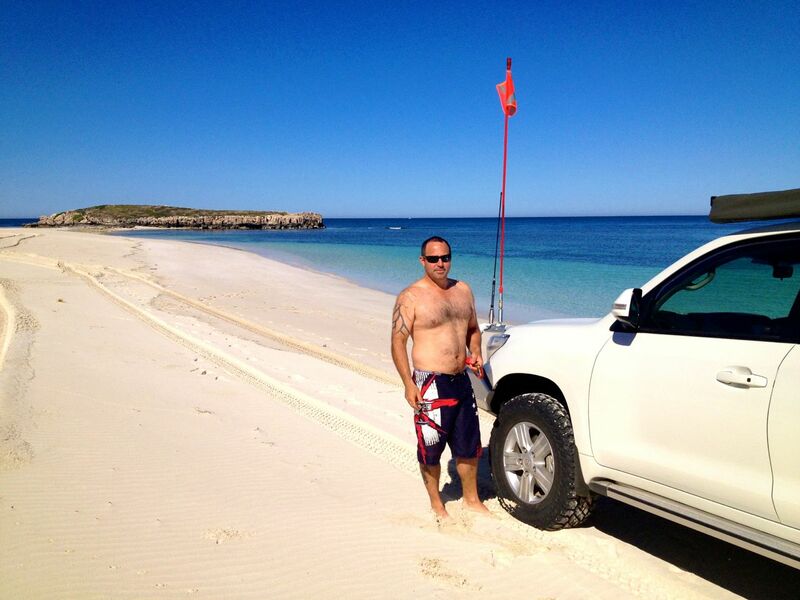 Jurien Bay is a great town on the west coast approximately three hours north of Perth. The fleet was blessed in the morning and the festival kicked into full swing with your typical coastal community activities including market stalls, side show alley for the kids, cars, boats, displays, raffles, competitions and music. The highlight for us was the very ‘prestigious’ Rope Coiling Championships: a quintessential fishing town activity that had the crowd in fits of laughter. Local deckhands lined up to show their skills at coiling 60 fathoms (around 120 metres) of cray pot rope. And there was some skill amongst the group. There were heats for the men, juniors, girls and even the veterans. There was loads of jostling, good spirited ribbing of the contestants and a real upset occurred when a Greenhead local took out the title! Time for some sundowners, so we headed back to camp. The seabreeze was in pretty strong, which gave some relief from the heat. We headed north along the beach and found that with such a low tide we could make it all the way north to the main campground. It was busy with loads of tents, campers and caravans. We love checking out everyone’s set up so we did the rounds of the campground before heading back for BBQ dinner. The Festival fireworks were planned for 8:15pm so we jumped in Alby and drove through the scrub to a fabulous vantage point right on the ridge leading to North Head. With a direct line of sight across the ocean to Jurien, we watched the fireworks as they illuminated the town’s foreshore. It was a great display that went for the full 15 minutes – not a bad show for a little town! Early Sunday morning we jumped out of bed to find that the ocean was glassy. Keen for a SUP we headed to the point and planned a paddle across to the island to play with the little sea lions. No sooner were we on the water than a howling NE/NW wind kicked in. It was almost impossible to paddle into so our SUP expedition was short lived. We’ve swum and played with the sea lions so many times before and we know there will be other opportunities in the future. Back to camp and we started packing up in between cooking and eating our bacon and egg sarnies. The flies were very friendly in the easterly wind so we were glad to be packed up before the heat really kicked in, and heading to the beach for the day. A gentle seabreeze came in and we camped up for the day right at the water’s edge. Magical: aqua blue water, full shade from our new RV awning with extension, and that lovely gentle wind. We had loads of swims and plenty of dozing and relaxing in the shade. 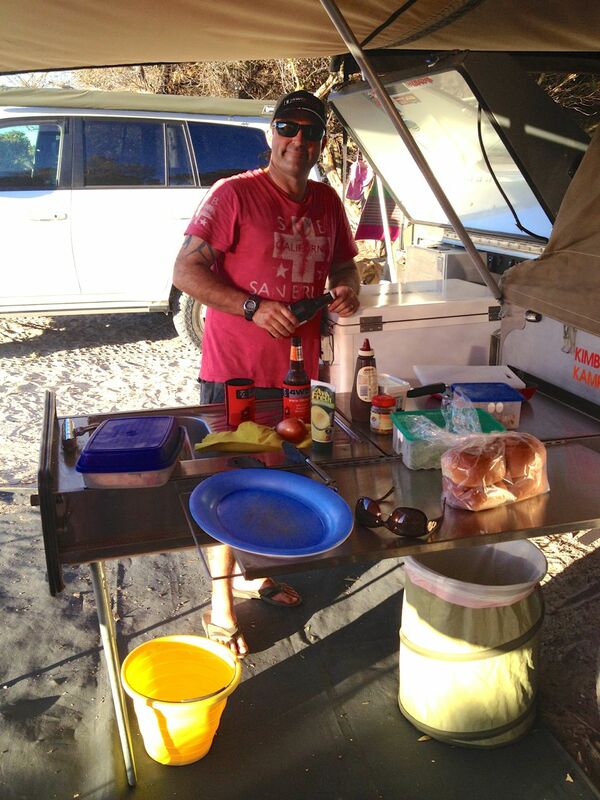 It was pretty handy having the camper in tow as we had full access to the kitchen, water and food. A cool shower after our final swim was just what we needed. After a very relaxing, warm weekend, we finally pulled up stumps. With the low tide, we decided to head back around to the north side of the point before veering off the beach. Carelessly, we only half committed to the exit and so pretty quickly, all six wheels went down in the soft sand. Luckily we had four Max Trax with us and so the digging commenced. Tyres went down to 12psi as we were in really soft stuff. With low range engaged, after each attempt to get up onto the surface of the sand, we moved the Max Trax forward until after the fourth attempt we were clear and on a downhill stretch. We made it off the beach just south of the main campground and cruised on through to the gravel. It was a bit of a marathon to pump up all six tyres to normal road pressure, but we got there in the end and had Alby safely navigate us home from yet another great weekend on our gorgeous west coast.